It’s time to celebrate nurses and all that they do. It’s National Nurses week! 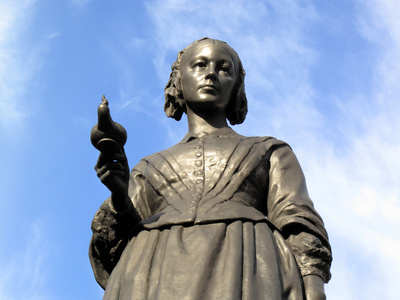 The week runs from May 6th through May 12th, which is the birthday of the founder of modern nursing, Florence Nightingale. National Nurses Week seeks to highlight the many contributions made by nurses. They work tirelessly to help people of all ages, backgrounds, and medical conditions. Nurses can be found throughout hospitals, but also can be found in various community settings such as homeless shelters and schools. Nurses’ roles range widely, from nurse practitioner to health educator to nurse researcher. But they’re all nurses, and this is their week to be recognized! “During National Nurses Week, we recognize the tremendous contributions that nurses make to keeping America healthy. As passionate advocates, leaders and innovators for better health, America’s nurses have demonstrated their commitment to meeting the public’s health care needs,” commented Kathleen Sebelius, Secretary of the Department of Health and Human Services (HHS). According to the Center for Disease Control and Prevention (CDC), nurses are important for helping improve patient outcomes, lowering health care costs, as well as increasing access and coordinating care in medical situations. Past studies have shown that patients have a higher chance of death, poorer health outcomes, and increased problems coupled with less satisfaction when there is a shortage of nurses on the medical staff. To help people raise awareness, the American Nurses Association has provided a number of examples of how people can celebrate National Nurse Week. For example, community members can plan a special recognition ceremony or a ceremony to honor local nurses. As well, they can host a fundraiser and donate money to a charity to raise awareness about nurses’ role in the health care system. Lastly, nursing and health care organizations can collaborate on National Nurse Week by planning joint events. The American Nurses Association also details the long history of National Nurse Week. It was first proposed of in 1953 and observed in 1953 from October 11 to October 16. In January 1974, the International Council of Nurses first proclaimed that May 12 would be known as “International Nurse Day.” To further that, President Richard Nixon enacted in February 1974 a week that would be designated as National Nurse Week by the White House. In 1982, both the ANA and the U.S. Congress decided to recognize May 6 as “National Recognition Day for Nurses.” The ANA Board of Directors then expanded the celebration of nurses to a week-long recognition, with May 6 to May 12 declared as National Nurses Week. In 1993, the dates of May 6 to May 12 were finally designated the permanent dates for National Nurse Week for 1994 and the years following.